Galewood is a unique and rather special opportunity to purchase this fine Grade II Listed Edwardian residence in this most enchanting location set within woodland on the Gog Magog hills about 1 mile to the South of the city boundary. This wing of this grand Edwardian house extends to about 3000 sq ft with a wealth of attractive features together with its own private grounds which extend to about 1.8 acres of formal gardens and woodland. LOCATION Galewood is a unique and rather special opportunity to purchase this fine Grade II Listed Edwardian residence in this most enchanting location set within woodland on the Gog Magog hills about 1 mile to the South of the city boundary. This wing of this grand Edwardian house extends to about 3000 sq ft with a wealth of attractive features together with its own private grounds which extend to about 1.8 acres of formal gardens and woodland. 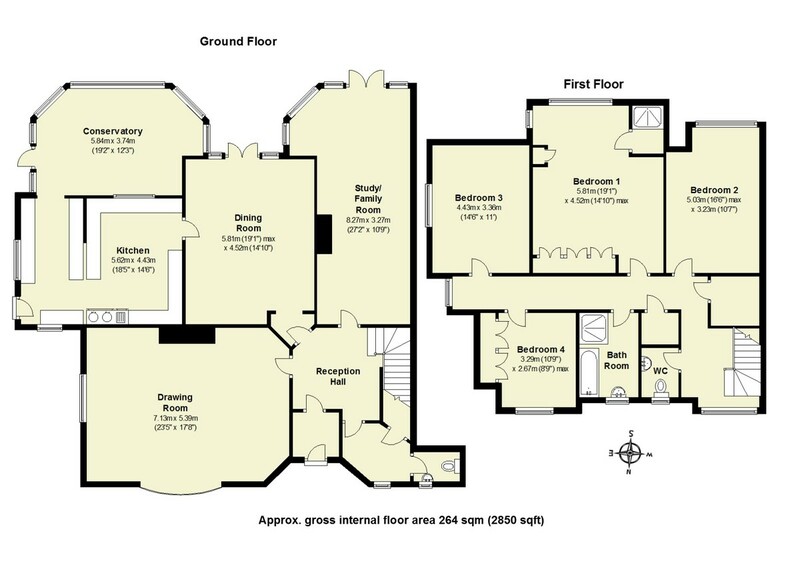 RECEPTION HALLWAY with oak staircase rising to the first floor with return landings, radiator, tiled floor. CLOAKROOM with coat hooks, tiled floor, part tiled walls, radiator, window to the front, access to understairs storage cupboard. DOWNSTAIRS W C with low level w.c., wash hand basin, window to the front. DRAWING ROOM with decorative moulded ceiling roses, moulded cornicing, moulded dado rail, radiators, feature open fireplace, Adam style surround, marble hearth and slips, wall lights, bow window to the front, window to the side. STUDY/FAMILY ROOM with double glazed extension enjoying views of the garden, moulded cornicing, wood flooring, feature fireplace (presently sealed), stone surround, timber mantel, granite hearth, a pair of radiators. DINING ROOM with moulded ceiling rose, moulded cornicing, covered radiators, twin double glazed French doors leading out to the garden. BREAKFAST ROOM part double glazed vaulted ceiling, double glazed to three sides, tiled floor, radiator, enjoying glorious views of the grounds, double glazed door leading out to the garden. GALLERIED LANDING with oak handrail, newel post and spindles, window to the front and side, picture rail, radiator, storage cupboard with access to loft space, radiator, airing cupboard housing insulated hot water tank. BEDROOM 1 with a range of fitted bedroom furniture, hand wash basin, double panelled radiators, windows to two aspects. ENSUITE SHOWER with tiled walls, wall mounted shower controls. BEDROOM 2 with radiator, hand wash basin, window to the rear. BEDROOM 3 with a range of fitted bedroom furniture, hand wash basin, radiator, window to the side. BEDROOM 4 with a range of fitted bedroom furniture, radiator, hand wash basin, window to the front. BATHROOM refitted with white suite comprising panelled bath with mixer/shower tap, tiled shower cubicle with glazed door, wash hand basin with storage cupboards and drawers below, heated towel rail/radiator, tiled walls, window to the front, extractor fan, ceiling with inset downlighters. W C with low level dual flush w.c., and wash hand basin, radiator, window to the front, part tiled walls and floor. OUTSIDE Galewood is in a most attractive semi-rural location approached via a gravelled driveway through woodland setting with GARAGE and parking area. The property stands comfortably within its own delightful established grounds in all extending to about 1.8 acres which are part woodland and formal gardens. STORAGE BARN with pitched felt roof underneath weatherboarded elevations with power and light connected, windows to three sides. The formal grounds to the rear are principally laid to lawn with a number of fine specimen trees and mature shrubs, ornamental pond, Breeze house and woodland. SERVICES Mains electricity and water are connected to the property. Independent private water supply and shared private drainage between 5 neighbouring properties.